My name is Euan Pritchard. I am 33 years old and I currently live with my wife (of three years) in married accommodation at RAF Lossiemouth. We have recently moved here after a three-year spell at RAF Marham in Norfolk. By day, I am a qualified military Engineer – I have served almost six years in the Air Force. I have been lucky enough to travel to some amazing places during my service, for both deployment and leisure purposes. Before I joined I was an Architectural Technician for six years in the Scottish Borders. My hobbies include Football, where I am a representative at semi-professional level. I have played for civilian and RAF teams and been very fortunate to win a few trophies over the years (personal and team). I am also a keen runner and when relaxing, a real boxset / movie addict! I have completed two ‘running based’ fundraisers in the past. 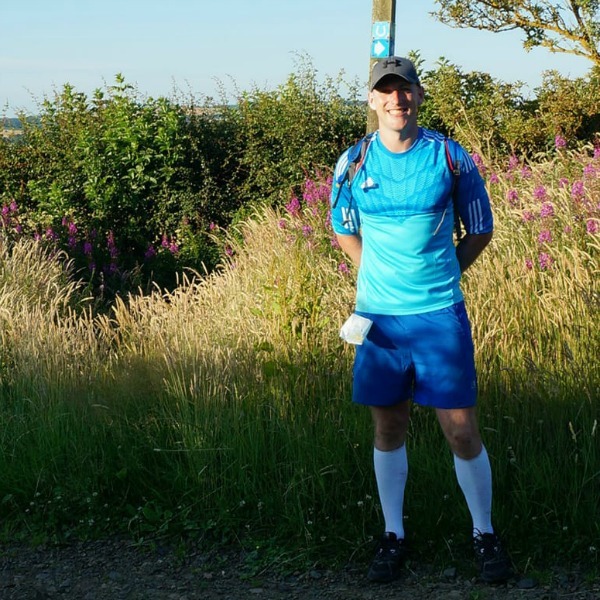 These were ‘Four Marathons In Four Weeks’ for Alzheimers Scotland and the 2017 Trail Outlaws ‘Saint Cuthberts Way’ Ultra for Oldies, a Dog charity. After a turbulent year in 2018, unfortunately having to say goodbye to the other love in my life, my beautiful Dog Leyla, I decided it was time to do something else. So I will be running for Bravehound this time, a charity that provides dog assistance to war veterans to help them through tough times. I am completely out of my depth and practising endlessly to make sure I finish the WHW Ultra, which will undoubtedly be one of my greatest ever achievements.